Maya is a young adult German shepherd mix with a fulfilling life. Along with Sally, her single and self-employed “parent,” Maya hikes daily and spends much of her time resting on the couch while Sally works at the computer. When Maya is left alone, however, the situation shifts from peace to pandemonium. During a recent weekday Sally was away for 4 hours; she returned to her 1-bedroom apartment to find the refrigerator pulled open and its contents—including liquids and a stockpile of eggs—entirely emptied onto the floor. And Maya was nowhere to be found. A broken screen led Sally to the neighbor’s house—and Maya. Several hours earlier, the neighbor had found Maya walking down the street. After returning home with Sally, Maya sat in a remote corner, head down, wearing a pitiful, conscience-stricken expression. Dogs are social animals and, by nature, prefer the company of people or animals to solitude. Even dogs that appear independent, perhaps spending hours napping in a distant bedroom, base their independence on the fact that owners are not far away. As many of us know, there is a world of difference between dogs who wander to a quiet spot in the house and those who are left alone for hours as owners go to work, run errands, or participate in social activities. Some dogs seem deeply indifferent about human comings and goings (once their gastric and excretory needs have been met); others, while not entirely indifferent, resign themselves to the inevitable and sleep through the day. There is a problem, though, when dogs left alone are significantly distressed. Separation anxiety is the clinical diagnosis applied to a variety of behaviorial issues that have one thing in common: the dog is “left behind” by its human. It can present in several different ways, with a range of intensities. Usually young to middle-aged adults (but possible at any age beyond puppyhood). Young puppies do exhibit distress in their new homes, often the first time they are separated from littermates or mothers, but are not considered to have clinical separation anxiety unless distress persists beyond early puppyhood. Diagnosis confirmation usually requires videotaping, or even audiotaping, the dog when the owner is absent. A dog with separation anxiety will chew, vocalize, pace, or eliminate only in the owner’s absence, typically immediately after, or within 30 minutes of, the owner’s departure. In addition, the dog will appear distressed rather than “bored” or playful; distress will typically be accompanied by pacing, whining, panting, and restlessness. Confinement distress is common in dogs with separation anxiety, but may be a stand-alone diagnosis for dogs that panic when faced with a barrier (crate, gate, or closed door). In some cases, discontinuing crate use can resolve the problem. Incomplete house-training can be confused with anxiety-related inappropriate elimination, especially in young dogs or newly-adopted adult dogs. When dogs urinate or defecate due to separation anxiety, it typically happens soon after the owner leaves. In addition, elimination must occur in the owner’s absence to be attributed to separation anxiety. Keep in mind, though, that some (clever) dogs will eliminate in the owner’s absence to avoid punishment. Medical illness should always be considered when a dog presents with a behavior issue, particularly those that have appeared acutely. Urinary tract, gastrointestinal, or other physiologic disease and seizures (with associated elimination), and cognitive dysfunction syndrome (in senior dogs) are some illnesses that can mimic separation anxiety. Play-related chewing is typically not limited to exit points or windows, but can be confused with separation anxiety when the anxious dog chews/rearranges the owner’s personal items. Video can help distinguish play from distress. Thunderstorm/environmental fear and phobia can present with similar clinical signs as separation anxiety but, by definition, this distress is associated specifically with storms or loud noises. If the dog has been conditioned to fear stimuli associated with thunder and lightning, such as wind or light rain, diagnosis may be more difficult. Vocalization can be triggered by environmental sounds, such as barking of neighbor dogs, garbage trucks, children’s voices, and a clanging mail slot. This barking may generate complaints from neighbors. Anxiety-related barking or howling is more persistent. In addition to the high level of stress it creates in affected dogs, separation anxiety can have a significant impact on the owner’s life. Owners may opt to often stay at home—7 days a week—to avoid unwanted behavior. The fallout from separation anxiety, such as destuctiveness, may lead to relinquishment or euthanasia. Treatment, therefore, should be aggressive but planned with caution to prevent any increase in the dog’s anxiety. During behavior and environmental modification, if possible, have the owner make arrangements to avoid leaving the dog home alone. Owners may take their dogs to work; arrange for day care; or leave them with a neighbor, relative, or friends. While crating may seem to be an easy solution for elimination and destructiveness, in most cases it is not recommended because the dog may attempt to escape from the crate, which can lead to severe self-injury. Use of a crate may ultimately be possible if introduced slowly while the owners are home, but first-tier use of a crate for an inexperienced and anxious dog should be avoided. Identify a dog-proof area, such as the kitchen, mudroom, or spare bedroom. Ideally, this safe haven should be a space where the dog, on its own, chooses to sleep at times. Have the owner invest in a tall, securely bolted, and easily opened gate for the safe haven; many dogs panic when faced with a shut door. Dogs with separation anxiety are stressed and often traumatized, with an impaired ability to learn new tasks. While behavior modification can be effective in treatment of separation anxiety, anxiolytic drug therapy can facilitate treatment and, in many cases, reduce anxiety more than training or management changes alone. Drug therapy is commonly used to assist with behavior modification; it is both humane and helpful. Alternatively, other selective serotonin reuptake-inhibitors (SSRIs), such as sertraline or paroxetine, can be used. A sedating anxiolytic administered on an “as-needed” basis when the owner leaves can help further reduce distress. 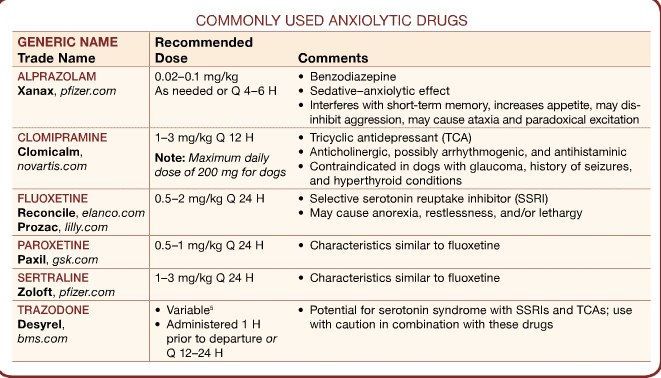 Benzodiazepines, such as alprazolam, diazepam, or clorazepate, are most commonly used but should initially be titrated to optimal sedative–anxiolytic effect while the owner is home to observe the dog’s initial response to the drug. Owners should be reminded that benzodiazepines can interfere with short-term memory and learning and, therefore, should not be administered before training sessions. This class of drug may cause paradoxical excitation; therefore, monitor dogs receiving benzodiazepines and, if needed, adjust the dose or discontinue the drug if excitation is observed. Trazodone has recently been added to the anxiolytic armamentarium.5 A serotonin antagonist-reuptake inhibitor, it can be given as-needed or regularly. However, due to the potential for serotonin syndrome when used concurrently with SSRIs or clomipramine, it should be used with caution and appropriate follow-up. Pheromone products can be effective in treatment of separation anxiety.6 A dog-appeasing pheromone (ie, Adaptil [formerly D.A.P. ], ceva.us/us) is often used in conjunction with drug therapy. Duration of therapy: Suggested duration for behavior medication is 4 to 6 months or at least 2 months past resolution (or satisfactory improvement) of separation anxiety. 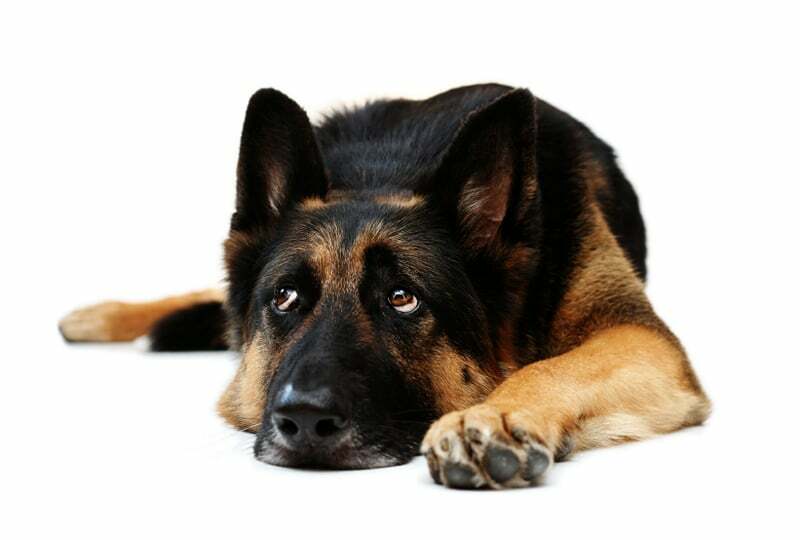 Some dogs with separation-related anxiety and underlying generalized anxiety may require lifelong treatment (although uncommon), while others may need to resume pharmacotherapy in the future. Cessation of therapy: Drug therapy should be tapered conservatively (not more than 25% reduction per 1 to 2 weeks); if separation-related behaviors return, the lowest effective dose of the daily drug can be maintained longer-term. Monitoring: Annual blood and urine analyses, or semiannual for senior dogs, are recommended in cases of long-term drug therapy. A baseline for panting, pacing, urination or defecation, whining or barking, and digging/chewing—as well as their timing and intensity—is needed to determine whether treatment is working. A video camera can be aimed at areas where elimination or destructiveness has occurred; recording 30 to 60 minutes will provide a reasonable idea of the dog’s distress immediately after departure. Audiotaping may be enough if barking is the primary complaint. Video- or audiotaping should be repeated as needed to monitor progress. A journal of the dog’s behavior is also helpful and should include (when relevant) elimination behavior outdoors as well as when the owner leaves the house and returns. Dogs that cannot adapt to being separated when the owners are home may be less likely to tolerate the owners’ actual departures. To encourage independence from the owner, provide a mat, open crate, or safe haven room where attention is offered when the dog is calmly sitting or lying down in this area. This area can then eventually be used when the owner actually departs. To facilitate this process, give the dog a food-dispensing toy, such as a Kong toy (kongcompany.com). Anxious dogs may benefit when fed from food-dispensing toys (rather than a bowl) because the toy distracts and counterconditions; in other words, it redirects the dog’s attention to something pleasant during an unpleasant time. Food-dispensing toys should be offered at other times as well to keep their presence from becoming associated with a stressful event and a trigger for anxiety. If working with a mat, the mat should be picked up between training sessions. Use of the mat can become a comfort cue, available only when the owner is present and the dog is learning to be relaxed and eat as the owner walks around. A stay cue can also be used as a calming exercise: the owner can work up to a 30-minute stay exercise. It is important, however, to only use the stay cue for training, not when the owner actually departs the home. Remember, it is helpful if the dog participates in determining its safe place—a location the dog itself chooses often (eg, owner’s bedroom). Implementing drug therapy with anti-anxiety medication. As the dog’s anxiety is ameliorated with treatment, food toys become more interesting. Introducing the food toy when the dog is calm and the owner is home. Desensitization can be helpful for dogs that become reactive at the moment of departure—when owners walk to the door, open it, and walk out. Once these dogs have been taking a daily anxiolytic drug for at least 1 month and have learned to manipulate food-dispensing toys in their safe havens, owners may start to desensitize. This technique introduces repeated exposure or habituation to departure cues, such as picking up keys, turning off lights, and donning a coat. These departure exercises can be an important component of separation anxiety treatment. This process helps dogs disassociate these cues from actual departures. In addition to helping the dog disassociate departure cues from actual departures, it is also helpful to change things up, including having the owner leave through a different door, put a coat on in the garage, or park down the street. Once the dog has responded well to simulated departures and changes in departure cues, owners can begin working on desensitization to actual departures. At first, departures should be brief and the owner should not leave. The door can be approached, touched, opened slightly, and closed. The duration of departure should be determined by videotape. For example, if the owner leaves for 5 minutes but the dog is calm for only 3 minutes, 5 minutes is too long and the time should be shortened. Depending on the dog’s tolerance, the first actual departure may last from a few seconds to a few minutes; the length of each subsequent departure should be gradually but randomly increased by a few minutes. It is important to realize that breaks in the dog’s calm behavior—rising, approaching the door anxiously, vocalizing, and/or acting nervous—indicate the desensitization session has moved along too quickly; end the session after a few “successful” but shorter departures. In subsequent sessions, the dog should participate in less challenging exercises that it can successfully tolerate. If desensitization-to-departure techniques are performed too soon or without regard for the dog’s reactions, they can backfire by sensitizing the dog and increasing its distress. To decrease the impact of owner departures, owners should not change noise levels (radio, television), lights, or gates when leaving. This includes minimizing owner–dog interactions prior to the owner leaving and then returning. A white noise machine can help muffle outside noises and provide background sound rather than silence. In addition to, or instead of, “white noise,” classical music or talk radio can be provided. Counsel owners to avoid punishing the dog for anxiety-related behavior. By definition, punishment is unpleasant or aversive. Whether the dog is chewing, digging, inappropriately eliminating, barking, panting, or pacing, all such behaviors are manifestations of distress. If the owner’s arrival home is associated with punishment, or the owner suddenly opens the door to shout at or otherwise attempt to discipline the dog, anxiety can worsen. The guilty look described by many owners indicates that classical conditioning has occurred: the dog now associates the presence of urine, feces, or destroyed items with the owner’s arrival (and punishment). Typically, the behavior will recur the next time the owner leaves. Thus, reprimanding the dog for bad behavior hours after the behavior takes place does nothing to prevent the behavior from recurring in the future. The case presentation at the beginning of the article left off with an anxious Maya and frustrated owner (Sally). However, implementation of several treatment modalities improved both Maya and Sally’s quality of life. Maya’s separation distress manifested through food-raiding; video revealed that her search for food initially took precedence over her pacing and intermittent whining. Then the discovery of a partly open window quickly led to digging, tearing, and jumping through the screen. Maya’s veterinarian determined that redirecting her food-seeking might resolve the destructive behavior, while more extensive behavior modification and drug therapy would be needed to ameliorate her need to find Sally. Food-dispensing toys were introduced; Maya received her breakfast through the toys each day. Food was put away and inaccessible; the refrigerator was padlocked for several weeks. Talk radio and lights were turned on well before Sally left in the morning and stayed on throughout the day. Windows were securely shut whenever Sally left the apartment. Medical therapy was initiated with daily administration of fluoxetine; trazodone was administered 1 hour prior to Sally’s departures. Sally was advised that separation anxiety may recur in the future, particularly after stressful events, such as boarding or prolonged absences. Bradshaw JWS, McPherson JA, Casey RA, et al. Aetiology of separation-related behavior in domestic dogs. Vet Rec 2002; 151:43-66. Flannigan G, Dodman NH. Risk factors and behaviors associated with separation anxiety in dogs. JAVMA 2001; 219:460-466. Simpson BS, Landsberg GM, Reisner IR, et al. Effects of Reconcile (fluoxetine) chewable tablets plus behavior management for canine separation anxiety. Vet Thera 2007; 8:18-31. King JN, Simpson BS, Overall KL, et al. Treatment of separation anxiety in dogs with clomipramine: Results from a prospective, randomized, double-blind, placebo-controlled, parallel-group, multicenter clinical trial. Appl Anim Behav Sci 2000; 67:255-275. Gruen ME, Sherman BL. Use of trazodone as an adjunctive agent in the treatment of canine anxiety disorders: 56 cases (1995-2007). JAVMA 2008; 233:1902-1907. Gaultier E, Bonnafous L, Bougrat L, et al. Comparison of the efficacy of a synthetic dog-appeasing pheromone with clomipramine for the treatment of separation-related disorders in dogs. Vet Rec 2005; 156:533-538. Sherman BL, Mills DS. Canine anxieties and phobias: An update on separation anxiety and noise aversions. Vet Clin N Am Small Anim Pract 2008; 38:1081-1106.